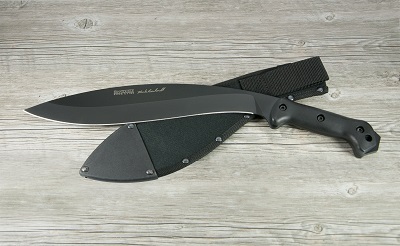 The KA-BAR / Becker "REINHARDT KUKRI MACHETE"
It's finally here! KA-BAR introduces the Becker / Reinhardt Kukri, a labor of love designed and perfected with Ethan Becker and the Reinhardt Estate to represent the best of the best in U.S. made kukri machete on the market today. Made from 0.2" thick 1095 Cro-Van steel, the kukri's 13.25" epoxy powder coated blade is proudly embellished with Hank Reinhardt's signature and coupled with Becker's distinct handle shape and a practical polyester sheath. This Kukri machete is an essential part of any outdoorsmen's gear and will handle chopping, clearing, or most any other Bush craft & camping needs that may arise. The extended pommel can be used for pounding such as setting tent pegs. This sturdy full tang kukri is constructed of 1095 Cro-Van steel with a HRC hardness rating of 56-58. The Kukri is flat ground to a 20 degree edge angle creating an excellent cutting edge and to maintain a strong edge retention and easy sharpening even in the field. The overall length of this kukri machete is 18.75" with a blade measuring a full 13.25". The Reinhardt Kukri is made exclusively in Olean, New York U.S.A. and proudly etched with the BKT / KA-BAR name brand. The Kukri comes with a reinforced polyester sheath. The scales which are constructed of smooth Ultramid are designed for comfort as well as control during use and has a wrist lanyard hole built in for added safety. Camping, hiking, or outdoor survival, this is the tool to have by your side. 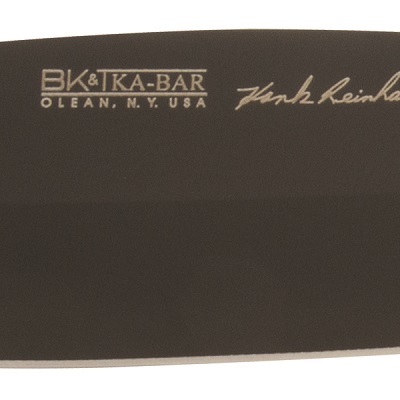 To view all of the Ethan Becker designed knives & products click here. Personalize This Kukri with Custom Laser Engraving. Phone Orders 1-518-298-2645 M-F 9-5 EST.